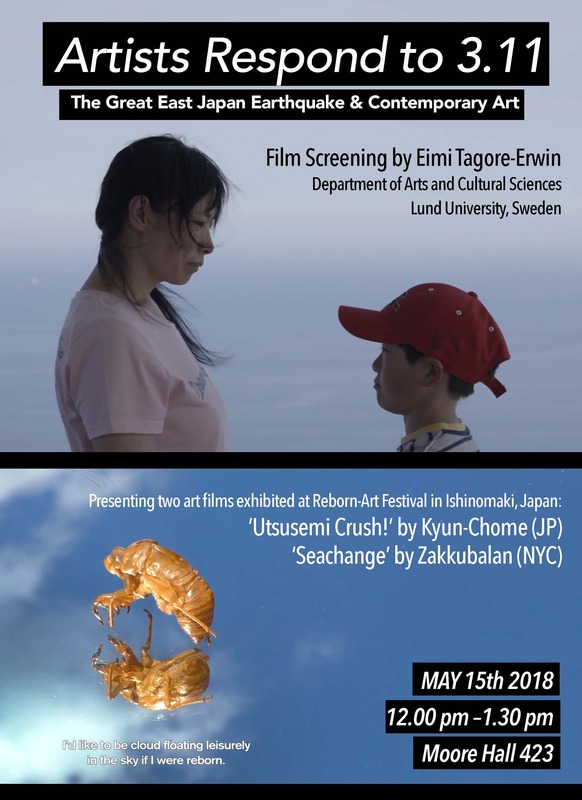 Eimi Tagore-Erwin, a graduate student in Visual Culture at Lund University, Sweden, will present a portion of her thesis that she completed as a Visiting Researcher in the Asian Studies Program at UHM in spring 2018. The topic of her thesis is ‘Reborn-Art Festival’, a socially-engaged art festival that took place in Ishinomaki, one of the communities that was hardest-hit by the 2011 earthquake and tsunami in Japan. Through consideration of artists’ responses to the Great East Japan Earthquake as a way of engaging in the socio-cultural work of ‘making sense’ of the catastrophe, her study of Reborn-Art Festival’s inaugural cycle investigates art’s potential to contribute to community recovery and empathic understanding of trauma. She will introduce and screen two short art films exhibited by two artists’ units as part of Reborn-Art Festival, before opening up the floor for discussion, questions, and responses to the films. Utsusemi Crush! by Kyun-Chome, a nomadic socially-engaged Japanese artist unit formed in 2011 following the triple disaster, made up of Eri Honma (b. 1987 Kanagawa Prefecture) and Nabuchi (b. 1984 Ibaraki Prefecture). Seachange by Zakkubalan, a New York-based American artist unit made up of filmmakers Neo Sora (b. 1991, New York) and Albert Thoren (b. 1992, Washington D.C.).